Back when I was a kid I was absolutely entranced and in love with tarot cards, they were wondrous, magical and each card featured amazing artwork – so began my tarot card collection. As I am sure you can guess I also adore vampires, so when I found out that there were vampire tarot cards I screamed with joyâ¦on the inside. 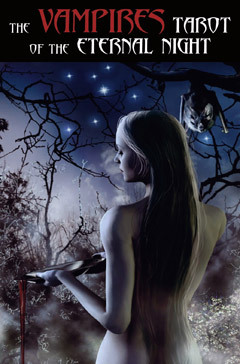 The Vampire Tarot of the Eternal Night: âAs interest in vampires surges to new heights, this deliciously macabre tarot will attract the masses who feel an insatiable passion for these creatures of the night. The deck has some pros and cons, but everyone agrees that itâs the best vampire deck out there (thereâs a few) and that Davide Corsi’s artwork is phenomenal. 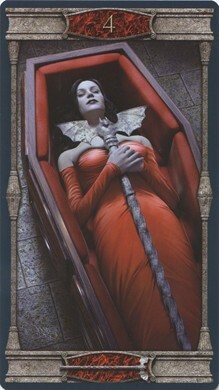 This is the perfect deck for vampire lovers looking to do darker readings. I agree… the artwork on this particular deck is beautiful. They are worth checking out just to see Davide Corsi’s work.